These handy mesh pockets fit inside the pockets of the SEASOFT PRO™ and SEALION™ BCs, the SEAWOLF Weight Harness™, and the QUIK DITCH Weight Pockets™. They have sturdy zippers and hold up to 15 lbs. of soft weights. Attached handles allow you to easily take your weight pockets out as required. 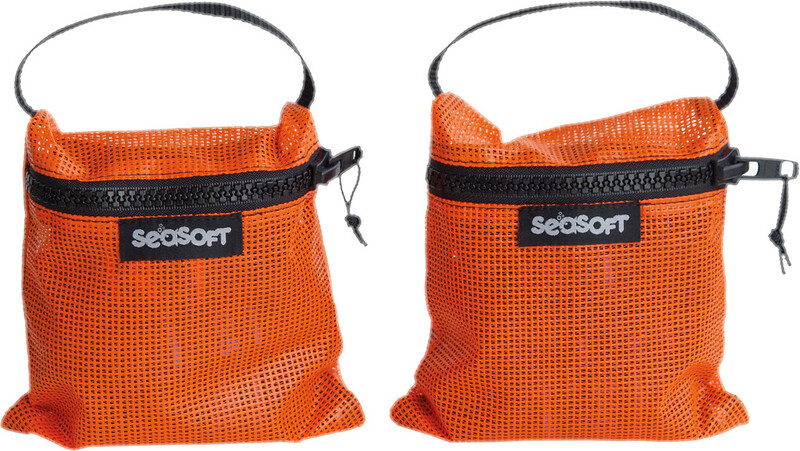 Part #: 201-005 ORANGE MESH POCKETS to fit the above BCs and older SEAWOLF™ Weight Harnesses. Holds 15 lbs. each. Part #: 201-006 ORANGE MESH POCKETS to fit the NEWER SEAWOLF™ Weight Harnesses and QUIK DITCH™ Pockets. Holds 20 lbs. each. They have sturdy zippers and hold up to 15 lbs. or 20 lbs. mof soft weights. Attached handles allow you to easily take your weight pockets out as required.